If you would've asked me 10 years ago what a Brussels sprout was, I would've told you I had no idea but it didn't sound like something I'd like. I certainly didn't know that there was an "s" after "Brussel," either...until about 6 months ago! Meat and potatoes were the staples in our house growing up, so unless it came in a can, most veggies were foreign to me. It seems like a lot of people are also unfamiliar with, or avoid, veggies in the cruciferous family: kale, broccoli, cauliflower, cabbage, etc. My guess is because they had a bad experience with the food as a child, don't know what the heck the vegetable even is (in my case), or haven't found a way to prepare said vegetable in a way they'd enjoy. I'm hoping to give you one tool for your toolbox to incorporate a new vegetable into your weekly menu. Cruciferous vegetables contain tons of fiber, vitamins C, E, & K, and antioxidants, and deserve a place in your life! Bacon (aka meat candy) adds some fat and salt to break up some of the bitterness of the Brussels sprouts. You can use this same technique for broccoli and cauliflower as well! Once bacon is done, dice it up into 1/4 inch pieces and sprinkle it over Brussels. Questions on nutrition? Topics you'd like to see? Drop us a comment or message a coach! Is the Food Industry Tricking You? There is SO much information out there about what we should or shouldn’t eat. Chances are you’ve at some point experienced this food confusion from something you’ve seen or heard on the news, on the internet, or from that health conscious lady at work. You know the one. So what’s real and what’s not? The best course of action is to trust science and reputable research institutions, but that’s not always an option for the newest diet or health foods. What we have to do in most cases is rely on things that have actually worked for people or what we can ourselves break down as true or false. The purpose of today's post is to dissect a small number of the most common misleading terms you’ll see in food and beverage marketing. Natural: No definition, therefore no regulation. In reality, a candy bar could be labeled as “natural” because at some point, most of its ingredients came from a formally “natural”, living thing. Organic: We don’t have enough space here to fully discuss the regulation of this term and it’s impact on the food industry. The biggest point I want to push is that if buying organic is important to you, do it. You might spend a bit more, but it’s likely worth it in the long run. The second, and maybe more relevant, point I want to make is that just because a product says that it’s organic, doesn’t mean it’s automatically healthy. Organic cookies are still cookies; organic Mac ’n Cheese is still noodles and processed cheese. In my opinion, if you want to eat cookies, you might as well just go for the real thing! You can view a list of the Environmental Working Group’s “Dirty Dozen” and “Clean 15” for produce most likely to have a high exposure to pesticides versus those with lower exposure here. Gluten free: Buckle up for this one. "Gluten free" is a very common term we see on food packaging, beverages, menus, and beauty products. At some point, “gluten free” was equated with health. I’ve seen this on bottles of water, health and beauty products, soap, etc. What is gluten, anyway? According to the Mayo Clinic, gluten is a protein found in wheat, rye, and barley. You’ll find gluten in bread, cereal, pasta, beer, some supplements and medications, processed meat and anything else processed in or around products containing gluten. People diagnosed with Crohn’s disease, celiac disease, and other inflammatory bowel conditions can be highly sensitive to ANY gluten exposure. There are also those who believe that gluten causes widespread inflammation in the body and should therefore be avoided even without a diagnosis. Unsure if you’re sensitive to gluten and don’t want to pay for a very expensive test to determine that? Cut it out of your diet and see what happens; feel better? Great. Stop eating it. No change? Eh, you probably don’t have a sensitivity. Paleo/Keto/(insert some other diet here): Do some of these diets work for some people? Absolutely. Are they sustainable long term? Maybe. I’m not here to attack the resurgence of Paleo and Ketogenic-style diets, just evaluate how those terms can be used to trick consumers in the last 5-10 years. For example, just because a product claims that it contains ketones, doesn’t mean that you’re going to “burn” fat due to those ketones if you’re still eating carbohydrates! If a product claims that it’s “paleo,” it likely just means that it doesn’t contain processed grains/legumes/etc., and again does not automatically make it a health food. As personal trainers and nutrition coaches, we're frequently bombarded with questions pertaining to what's healthy or not, what foods people should or shouldn't be eating, and the standard "If I just had a food list of what I could and couldn't eat, I'd be successful." Unfortunately, there's no one correct way for everyone to eat so this request and these questions aren't easily answered. What fuels me isn't necessarily going to work for you. Coach Chris had the opportunity to learn about a new movement regarding individual gut microbiome testing and subsequent nutrition set-up from Naveen Jain, founder and CEO of Viome. Read on for a post from Chris! ​In February 2018 I was introduced to Viome. A Gut Micro-Biome Testing company that is changing my life. To make a long story short, I was searching for a diet to prescribe not only for myself, but for my clients to have long term success. It needed to be wellness driven and sustainable on any budget. Most diets focus on vanity and weight loss, which can be terrible for your health long term. We all know eating real food is the right thing to do, but in todays world it’s about impossible to stay 100% faithful to clean eating. Even if you ate a clean diet, how would you know the foods you picked were right for you? You wouldn’t unless you got your gut tested. Please give the following videos a chance and please think about the information given. If you want to talk after that, I would love to help you. If you’ve ever seen me at the gym between classes or working the front desk, chances are you’ve caught me snacking on something. Food makes my world go 'round and I'm definitely in the camp of "live to eat" versus "eat to live." The majority of my food comes in the form of three well-balanced meals, but snacks keep me going during long days and when I have short breaks in between classes, clients, and when I'm on the road. This is not to say that snacking is right for everyone; if you are looking to lose body fat, consistently snacking in between meals should not be a part of your plan. It’s not realistic, however, to assume that we’ll NEVER get hungry in between meals, in the evening, or when we’re in social situations. If you’re going to have something, it’s best to go in with a plan and an idea of what types of foods are your healthiest options. Some of the foods we hear people reaching for most often in the late afternoon or evening are either salty or sweet: chips, crackers, ice cream, chocolate, (insert junk food of choice). Instead of these foods with very little nutrient value, let’s look at some easy snacks that are high in both fiber and protein that will hold us over until our next meal. 3. FRUITS & VEGGIES! : Organic baby carrots, celery, baby cucumbers, mini peppers, grapes, cherries, dried figs or dates, olives. Make a little mix of whatever veggies and bite size fruit you like for an on-the-go snack pack. I’m obsessed with making these in jars! ​4. Beef jerky: look out for brand’s with a high amount of sugar or high fructose corn syrup (usually the second or third ingredient). If you’re used to snapping into a Slim Jim, consider a better option! 5. Nuts and seeds, including almonds, walnuts, cashews, unshelled sunflower seeds, pumpkin seeds, etc. Things to watch out for: anything salted or anything coated in some type of oil. I would highly recommend you check the ingredient list on any nuts or seeds to ensure that there aren’t any additional ingredients, even if the packaging says “raw.” We see many people who overdo it on nuts and seeds. A serving size is about one small palm full. A common habit for many is to grossly overestimate a serving size and/or continue to keep going back for more if they purchase a large container. I’d suggest either portioning nuts and seeds out or purchasing smaller, convenience packages that will prevent you from overeating. 7. Protein bars: this one is tricky, as most people lump granola bars, snack bars, basically any type of “bar” in with protein bars. Many bars in general are not far from candy bars disguised as health foods. A popular favorite has been the Kirkland Brand protein bars from Costco. Coach Kristin Hogan-Mathees did a huge bar review last year and found that the Kirkland protein bars were a great option in regards to ingredients AND cost per bar. Costco for the win. ​8. 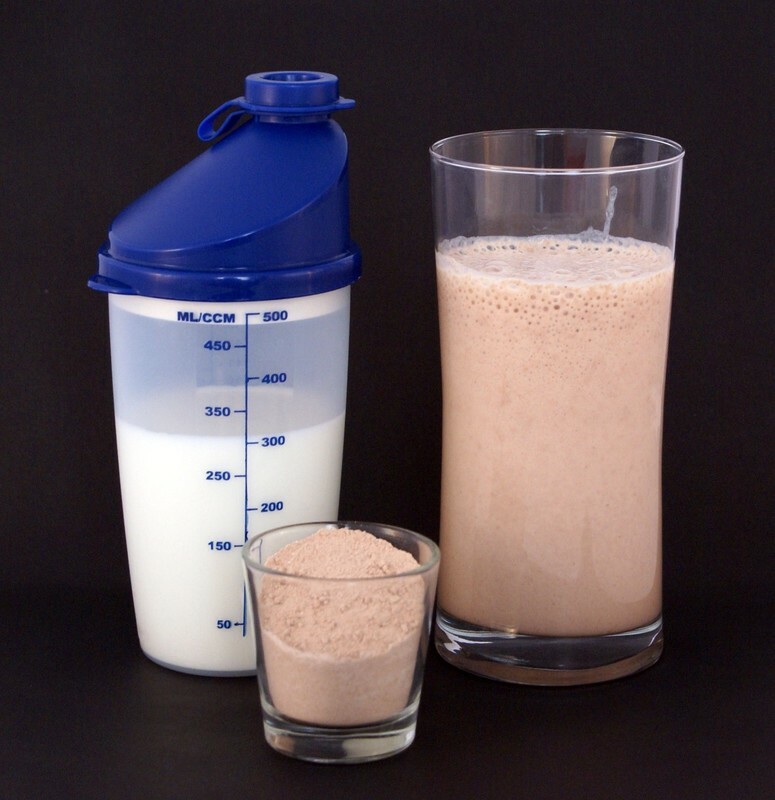 Protein shakes: blend your favorite protein powder with water or almond milk and some ice. With all things supplementation, make sure you know what’s in your products. A Mi-5 favorite is SFH brand! ​9. Stove-popped popcorn: top with a small amount of REAL butter, salt and pepper, cinnamon, or Bragg Nutritional Yeast (tastes like cheese!). 10. Last but not least, the best snack in the entire world: rice cakes and avocado. It’s crunchy, it’s savory, it’s filling. You can sub nut butter for avocado as well, just mind your serving size on nut butters; post on this coming soon. Snacks we want to avoid include anything with tons of sodium or sugar and very little nutritional value. This list will hopefully give you some additional tools to add to your healthy eating arsenal. If you've never hit the "hangry" wall, then you know you're more apt to reach for an emotional food choice if you don't have a plan. If you have any other healthy snack favorites, let us know! Looking for help with your nutrition going into the holidays? Unsure if what you’re eating is really all that good for you? Reach out to a coach! We’d love to help you complement the hard work you’re doing in the gym throughout the week with what you eat! I have to make a confession. When I started out as a nutrition coach, I thought everyone should be GLUTEN FREE, DAIRY FREE, SUGAR FREE. I have another confession….my clients saw phenomenal success eating this way. I have another confession…..I think they all secretly hated me. All kidding aside, what I saw was a very strict SHORT TERM success with eating and living this way. What happened over time was the obvious holidays, vacations, grad parties and the Minnesota State Fair type splurges. 5, 10, 15 lbs crept back onto their bodies and I felt totally responsible. Fast forward five years and I have adopted a much more open minded approach to coaching, especially nutrition coaching. I have spent years reading different books and articles, educating myself on different eating approaches and mindsets, added national accredited certifications, and even once set out on a mission to make my own food to sell. (If you were around for my muffins, pancakes and protein balls…you know what I am talking about). Although I do not agree that EVERYONE can adopt a mindset of “everything in moderation”, I do think the majority can find a balance with food. After all, food is meant to be enjoyed! We gather around food, we break bread, we celebrate milestones with it, and I for one really love the process of it all. Here are 5 simply “EAT THIS INSTEAD OF THAT” foods and recipes that I hope you enjoy. Instead of starting your day with sugary cereals, bagels, bread, juice and empty calories, try adding in protein. But what if you are sick of eggs? Check out Kodiak pancakes. I have seen these at Target, Hyvee and even Cotsco. If you are short on time, you can purchase these in the frozen section. Simply heat or toast and get out the door! You can add extra protein a few different ways. This morning I added in collagen protein, an egg, and Ripple milk substitute. You can also had in SFH protein powder for even more protein and flavor. Top these with your favorite nut butter, greek yogurt, fresh fruit, or a touch of real maple syrup or add in dark chocolate chips. I recommend Lily’s or Luv’s brands for no added sugar. Okay football fans. You are hosting the big game. You have your plate of veggies, hummus and guacamole. What about some savory appetizers? *Pre heat oven to 425. *Toss wings thoroughly in a high heat oil. I like avocado oil. (*do not use olive oil to cook with. It has a very low smoking point). I found great organic Coleman chicken wings at Cotsco. They were a great size, not a lot of skin, and baked up nicely. Covering the wings in oil helped from sticking and made them extra crisp. *Bake for 45 minutes in glass or cookie sheet. *Bake for an additional 15 minutes and BOOM. You have crispy, savory, delicious wings. *17.6 oz. container of FAGE Total, FAGE Total 2% greek yogurt. If you are truly lactose intolerant, you can use goat yogurt and goat cheese for this recipe. In a large skillet, add the oil and sauté the chicken over medium heat. Next, add the onion, garlic and bell pepper and sauté until the onion is translucent and fragrant. *If you are short on time, you can use a rotisserie chicken instead. Preheat broiler and adjust the rack so it is 6 inches from the broiler. In a large bowl, add the greek yogurt, cooked chicken mixture, cheese, hot sauce, paprika and scallions. Mix together until heated through and cheese starts to melt. Season with salt and pepper to taste. Sprinkle the blue cheese, feta, or goat cheese crumbles over the dip. Broil the dip for approximately 5 minutes, until the top is bubbly and golden brown. Serve with carrot sticks, celery sticks, or tortilla chips. Contrary to what we might think….liquid calories do add up. I am not here to say always avoid your favorite adult beverages, but be smart about what you are mixing with it, drinking before, after and in between, and just be mindful. But what if I am sick of just plain water? Spindrift actually has some flavor, no added sugars, and is my favorite of all sparkling/flavored waters. Still stuck on soda or diet soda? (If it were up to me, I would have put Coke here. Did you know in the south everything is referred to as Coke? Anyways….Zevia is a great soda alternative. My favorite is the cherry coke. Okay, you’ve got a breakfast, appetizer and beverage ideas. Here are a few simple easy sweet swaps! Dark Chocolate instead of milk chocolate. ​Lily’s has no sugar added, tons of flavors, and actually still taste like chocolate. I know everyone knows about Halo top ice cream, but here are a few different varieties. If you are dairy free, Luv's is my favorite brand! Luv’s ice cream has dozens of flavors made locally, and taste great! So Delicious no sugar added desert bars are also a great option. ​We work too hard INSIDE the gym not to compliment it with quality nutrition that actually tastes good. Enjoy your time with family, friends and hope you can enjoy some new food ideas and recipes. Memorial Day weekend 2017 was one for the books. 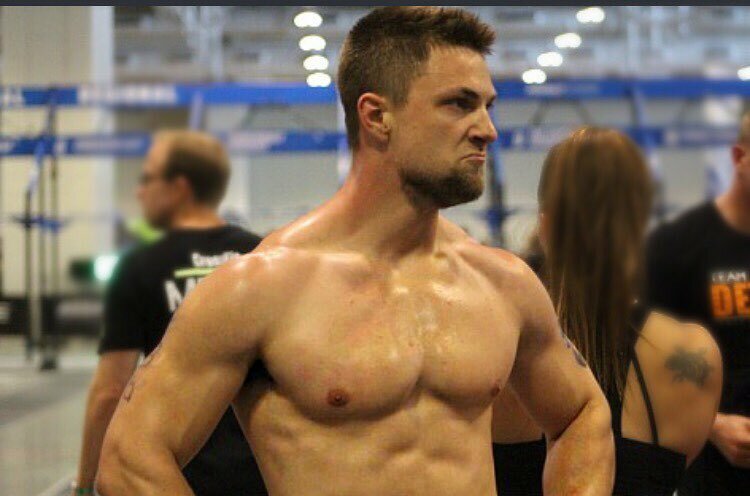 I was fortunate enough to compete in my third consecutive CrossFit Regionals. This year the competition was held in Nashville at the Music City Center. 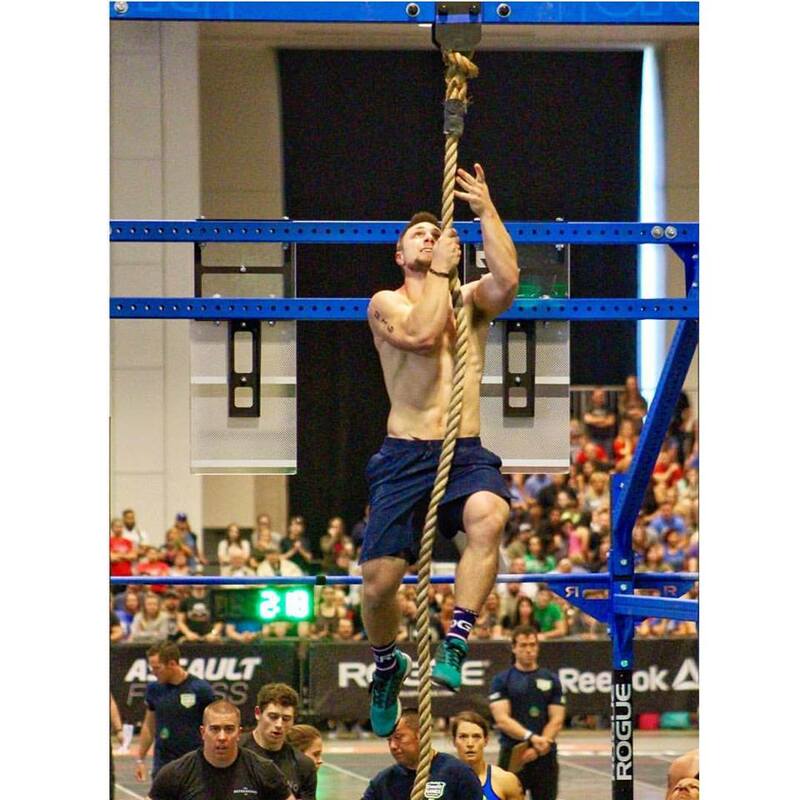 Going into the weekend we had our sights set high on finishing in the top five and qualifying for the 2017 Reebok CrossFit Games in Madison, Wisconsin. This year’s competition included 6 events (2 per day) to find the fittest male, female, and team in the central region. My team (CrossFit Detour) had a great outing by finishing in the top 10 for all six workouts. Our best finish was event 2 with a third place finish. After day 1 we were sitting in 4th place and feeling really good about our chances to move on to the next stage. Unfortunately we had some questionable calls and poor execution on a few of the events and we finished 6th overall on Sunday night. For those who don’t know, the central region is the largest and most competitive region in the world. We have 11 states in our region where other regions in the U.S have 4-6. All in all we competed hard and put everything we had on the floor. The hardest pill to swallow is the fact that in any of the other 7 regions in the world, we would have qualified for the CrossFit Games. However, that is sports and with every experience comes something to learn for next time. ​I want to say thank you for every member at Mi5 Fitness who has helped me get to the point in my career where I am at right now. Being a professional CrossFit athlete is an extreme honor and I wouldn’t be able to do it without my support system and the people at my box. Also, thanks to everyone who purchased a shirt and donated money to help fund my journey to regionals. You guys are all awesome and I am very thankful for you! 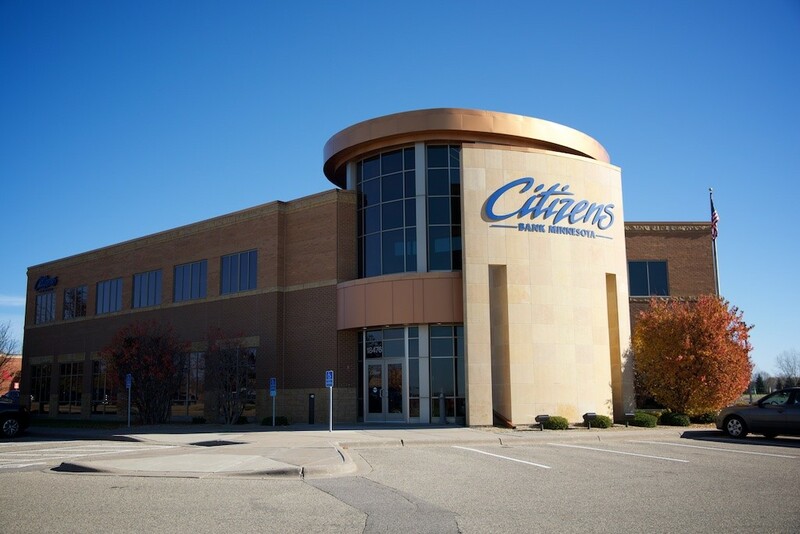 Today’s guest post is from Lakeville Chiropractor Dr. Jeremy Marty with Marty Chiropractic & Wellness. As a collegiate Track & Field athlete, recovering from each workout was an important part of maximizing performance, continued improvement, and limiting injury. First of all, lets breakdown the science behind building muscle. A major misunderstanding most people have is that working out DOES NOT build muscle. The recovery AFTER your workout is what builds muscle! Any type of exercise, weightlifting in particular, breaks down your muscles through a process called catabolism (think the opposite of anabolic steroids). This results in micro-tears in your muscle tissue. When your body repairs these micro-tears, it wants to build a bigger, stronger, thicker muscle to prevent injury the next time you perform a similar task or exercise. If you continue to exercise without proper recovery time or nutrition to support muscle repair and growth, the micro-tears will eventually build up to a point where they become a larger tear. This can be a specific injury such as a muscle strain or tear, or a widespread overuse injury such as Lifter’s Shoulder. This is also why some people will plateau even though they are putting more and more time into the gym. 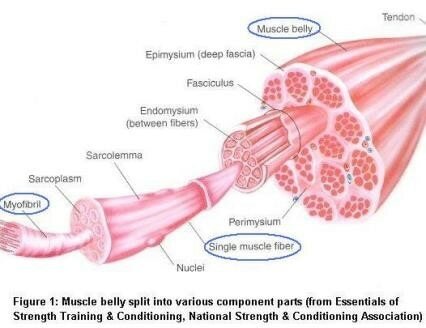 ​Note the size of the single muscle fiber in comparison to the entire muscle belly. Now note the size of the myofibril and sarcoplasm. These tiny cells are where the actual muscle hypertrophy takes place! To maximize muscle growth, each individual cell needs proper rest, proper nutrition, and of course, proper exercise. 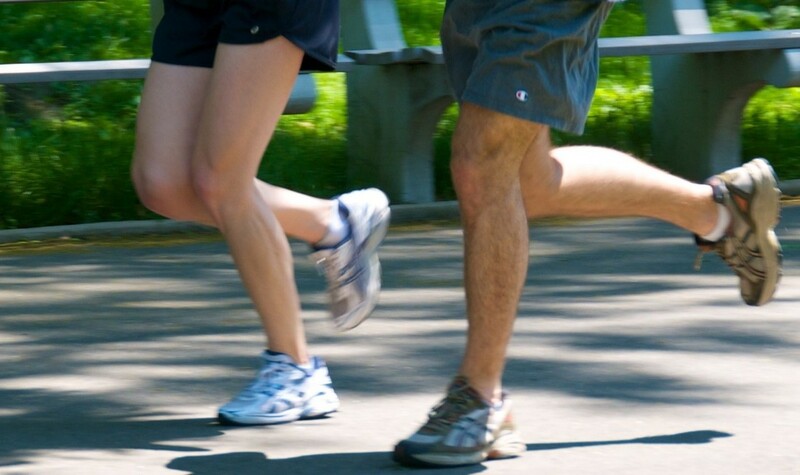 Here are a few simple guidelines to follow when exercising. ​We’re all familiar with the saying “no pain, no gain.” There is a definite need to push yourself past your comfort level in order to make progress not only in exercise, but in any area of life. However, this progress is INCREMENTAL! Tiny improvements every day lead to small improvements every week. Weeks build into months, years, and decades. Persistence and dedication to your routine are important, not trying to impress everyone in the gym and ending up too sore to work out for a week. If you are having moderate to severe muscle soreness that lasts for more than a couple of days, you are pushing yourself too hard! This will actually slow down your progress by preventing your body from recovering at a cellular level. ​Improving your form is a great way to build muscle strength for a few reasons. First, it helps prevent injury which will help keep you in the gym. Second, working a muscle through the full range of motion activates more of those myofibrils and sarcomeres we talked about earlier! This will result in a larger muscle, a more even distribution of strength through the entire muscle, and again help prevent injury. I would much rather have athletes deep squatting 135 lbs. than box squatting 225 lbs. Working through a full range of motion will also help engage syngeristic muscle groups, so you will get a more complete workout without having to add additional time to work out! Performing negatives or Eccentric lifts can also increase myofibril and sarcomere activation, but we’ll talk about those another time. While it’s tempting (and sometimes feels necessary) to sit around all day after an intense leg-day workout, it’s much better for your body to perform some type of active recovery. Whether this is hiking, biking, or just getting out for a walk, keeping your muscles active will help flush lactic acid buildup and improve your recovery time. Foam rolling is also a great tool to use on larger muscles for recovery! Check out our video where Dr. Josh demonstrates proper foam rolling technique. Sleep is one of the most under-appreciated aspects of recovery. Not only does getting an adequate amount of sleep (at least 7 hours is ideal, athletes may need more) greatly improve your physical recovery, it helps keep you mentally strong. Athletes who don’t get enough sleep commonly experience less drive during their exercise sessions. If you are someone who struggles to get enough sleep, try giving yourself a “no tech” time before bed. Turn off or put away all your electronics an hour or two before bed and see how much better you sleep! The lights from our screens interfere with the Pineal Gland’s production of Melatonin, making it difficult to fall asleep. Basically, your brain/eyes still think it’s daytime and you should be awake, alert, and ready for action. Nutrition for athletes varies depending on the activity and intensity. For weightlifting and muscle gain, one of the most important things to add is high quality protein. The human body contains 20 amino acids, 9 of which are essential. An essential amino acid is one that the body cannot make, and therefore must be consumed. Branched Chain Amino Acids (BCAAs) are especially important for muscle growth and repair! They provide nutrition for muscle growth while also preventing your body from breaking down muscle to use as energy. To see maximum improvement, make sure your protein supplement includes all 9 essential amino acids and especially the three BCAAs - leucine, isoleucine, and valine. You should also consume your post-workout protein drink within 2 hours of exercise. Insulin sensitivity is increased for up to two hours after intense physical activity, meaning the nutrients you eat within this window are more likely to be absorbed and used for energy and muscle growth.